I discovered that I am not the only one who is interested in the stock exchange. Many of my officemates are already playing in the stock exchange. Some of them chose the risky trading in exchange for short term income. The other group of Philippine Stock Exchange players wants minimum investment risk. The latter group of investors thinks more about the long term benefit. I joined the “minimum risk” group because the money that I will earn from my investments will go to my retirement fund. Fortunately, the Bank of the Philippine Islands (BPI) has a website that is for exclusive use of those who play in the Philippine Stock Exchange. This website or portal is the BPI Trade. The good thing with BPI Trade is that it can be connected to a BPIExpressOnline account. This makes funding my BPI Trade account easy. 1. Log-in to your BPI Trade account. Go to your “Portfolio” and copy your “Settlement Account” number. 2. Log-in to your BPIExpressOnline account. 3. Click on “My Portfolio” and then click “Enroll Additional Accounts”. 4. Choose “Other Accounts” and click the “Continue Button”. 5. 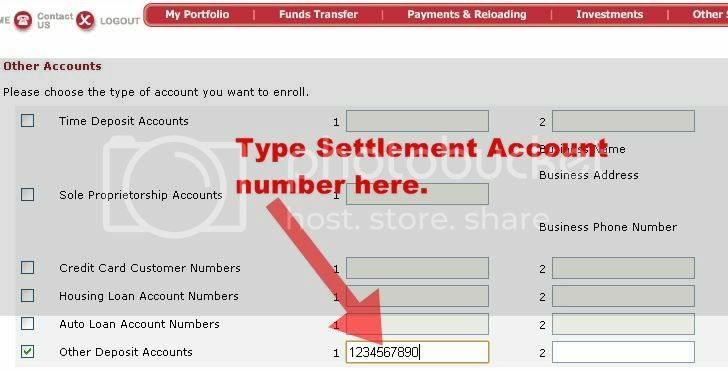 Check “Other Deposit Accounts” and type in your BPI Trade Settlement Account number on the number “1” field. 6. The Confirmation Page will appear. Just wait for the email message that will be sent out by BPI Trade confirming the activation of your enrollment. I just finished the enrollment of my BPI Trade account to BPIExpressOnline. It is easy! I am so excited to invest some of my savings. Don't you still have a BPIExpressOnline account. Read my post on how to apply to BPIExpressOnline. Email from BPI Trade did not give detailed and clear instructions re enrollment of settlement of account. This is really helpful. Thank you. hi, nagbago na po ata ang UI ng BPI trade ngayon. Saan ko na po makikita ang settlement account number ko? Wala naman settle account number or BPI trade account number sa portfolio. May Nagbago ba? Wala naman lamana yung portfolio. san po kaya makikita? Nagre-redesign ng website yung BPI Trade kaya hindi ko rin mahanap yung settlement account number. I will inform you once I found it. Thanks! ok na. tinawagan ko lang yung BPI trade. sinabi nila kung ano ang account number. Ang problem ko naman ngayon ang tagal ma approve yung enrollment of new account ko sa bpiexpressonline. 1 week na. hasyt. ok na. tinawagan ko yung BPItrade then sinabi sakin yung account number ko. Maraming salamat po sa feedback. Hopefully ma-approve ka na ng BPI Express Online. bpi can not be understand in processing and informing the applicant of the trade account, settlement account can not be found. I suggest that you call BPI regarding your problem. Here is the BPI hotline numbers: 89-100 (for callers from Metro Manila), 1-800-188-89100 (for domestic toll-free calls), +63 + 2 + 89-10000 (mobile phone and international access code). Wew... BPI lacks on giving information and instruction on how to fund and enroll BPI Trade account. In their instructions you must enroll your settlement account not our BPI Trade Account, hence BPI Trade Account is not disclosed on our BPI Trade activation email notice. Email support is so slow also. Contact/Hotline Number is not 24/7 its only from 7AM to 7PM. Hey, you are handling peoples money so be at least conservative or else they will lose their trust on BPI Trade. Hi Ishmael. Can you update this article using the new BPITrade user interface? It looks very different now as I can't seem to find where to input the settlement number. I have activated my BPITrade account months ago and until now my BPI EOL account is still not associated to it so I'm not able to fund. Hi. I'm a newbie on bpi trade account. I am planning to deposit my initial investment on my bpi trade account. How can I know the account name of bpi trade to deposit my initial investment. The only one I know is my settlement account number. I hope you will help me.